Teach your students the value of organization. Get started, find your school! Don't teach at a school? 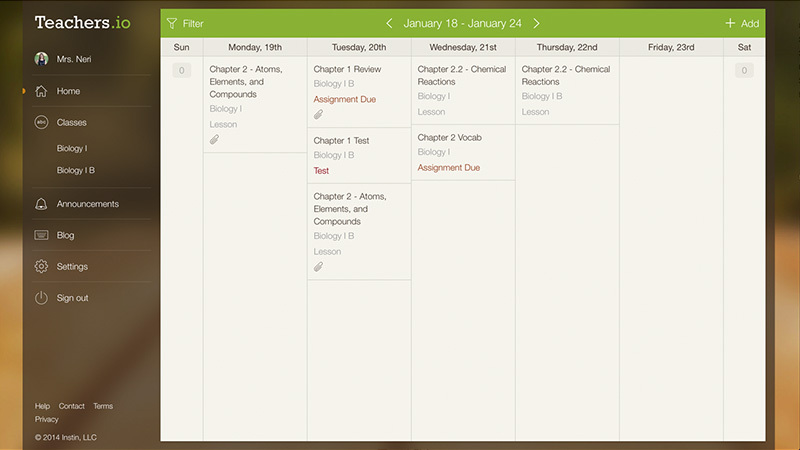 Teachers.io is the faculty companion app to myHomework, the most popular cross platform student planner app. Advanced tools, reporting and integrations make it easier than ever to monitor and teach organization skills in a digital world. Free capabilities within Teachers.io are just the beginning of what's possible. When you use free Teachers.io, Students using myHomework can easily join your classes and access the assignments, files, announcements, syllabus and other class information you share on Teachers.io. You also have the option of a public profile so students & not using myHomework can still easily get to your class information from your Teachers.io website. Teachers.io with myHomework works great for schools with BYOD policies (Bring Your Own Device) or 1:1 iPad programs. Teachers.io makes it easy to break tasks down into their most granular details making it easy to "show" your students how being organized helps them succeed. Lessons, Assignments and Tests can be copied between classes and semesters to save time. Teachers.io allows you to upload links and files for your classes, so your students don't struggle to find them. Teachers.io helps you create and share your syllabus. Easily send out an announcement to students and parents. If they are using the myHomework app they will be notified! You can choose to make your profile public and share your story with teachers, parents and students. Your free account comes with a blog, where you can share your thoughts, research and class related photos. Already have a website? You can use the teachers.io widget and have your class schedule embedded within your page.